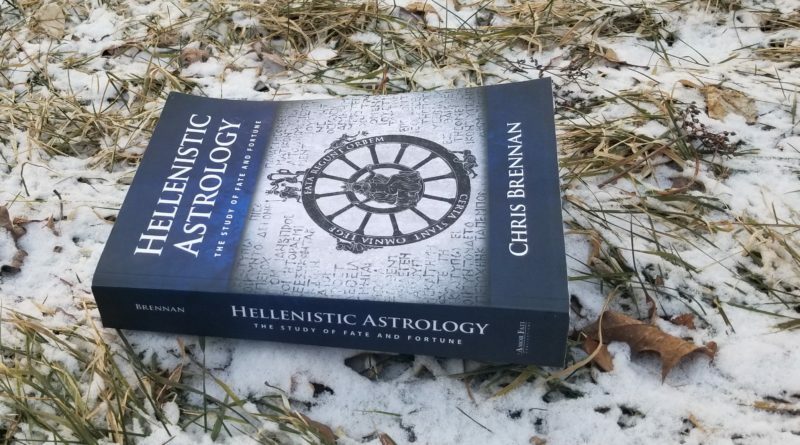 In commemoration of the second anniversary of its release, it is my pleasure to review Chris Brennan’s Hellenistic Astrology: The Study of Fate and Fortune. I have recommended Brennan’s course on Hellenistic astrology for many years. 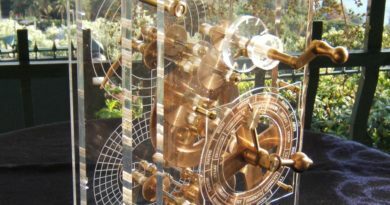 Chris has an exceptionally deep understanding of the history of early horoscopic astrology and the complications presented by early texts. He also has a knack for clarifying complex issues, whether historical, textual, or interpretive. I cannot recommend Brennan’s book more highly. It is an essential reference which you need in your library. His book makes accessible to a general public the origins of the symbols and techniques that astrologers take for granted. It is especially essential for those who would like to explore early astrology. If you’re like most astrologers then your understanding of astrology’s place in history is pretty fuzzy. When did the system of planets, signs, houses, and aspects come about? Who were the early influential practitioners of that system? How did early astrology fit in with the dominant political and religious movements of the ancient world? What separates later medieval astrology from Hellenistic astrology? Where did modern astrology come from? These questions and many more are addressed in the book in a captivating and scholarly manner. There are, in fact, a number of books which address the history of astrology. However, this book does the best job of staying concise, scholarly, and entertaining. It may seem strange to call Brennan’s treatment of history “concise”. After all, this is a 600+ page book. However, the historical piece is one among many. The first 5 of the 18 chapters of the book offer a concise, well-organized historical overview. You’ll learn about the emergence of horoscopic astrology, with its Ascendant and houses, and see what sets it apart. Brennan hits upon all the major questions regarding Western astrology’s origins. He addresses the astrology that came before it, its relationship with other astrological traditions, its major players, and how its fate was interwoven with that of the Roman Empire. The text has a novel-like clarity and momentum to its treatment of history, which keeps it ever fascinating, never dry. In addition to the historical overviews you’ll find short reference biographies of all the major astrologers of the early period (30 of them!). These bios are in chronological order and discuss each astrologer’s works. There is also a timeline of important developments in the history of astrology by century available in an appendix. Extensive footnotes and a 23 page bibliography will help you dig deeper after your curiosity becomes inevitably piqued by what you learn. This second reason is related to the first but pertains particularly to our understanding and practice of astrology itself. It is one thing to read a modern book about the planets, signs, aspects, and houses, with their significations explained. It is another entirely to examine the way these concepts were understood around the time they were created. You are in for a very deep dive into the richness and subtlety of the basic elements of the chart with this book. From a 43 page chapter on the meanings of the planets to a 73 page chapter on the signs of the zodiac. Chapters on configurations and on houses go beyond just explaining the history and use of aspects and houses. Brennan examines attempts to reconstruct the many subtle distinctions in meaning associated with complex configurations. He also tackles the confusing and contentious issue of house division. His explanations are always clear and emphasize the significant historical facts. As I mention in reason number 3 below, modern astrologers have a lot of misconceptions about traditional forms of astrology. It is often the case that astrologers assume that older interpretations of astrological signs and configurations will be overly fatalistic nonsense. Ancient astrology was more orientated toward fate and objective reality than to subjective psychology. However, it is also true that there was much more richness, nuance, and individuality associated with what things meant in any chart. In other words, the chart has more to say. In these days of Sun sign astrology, astrology tends to get over-simplified and dumbed-down. If you are serious about improving your understanding of astrology and its basics then this is the book for you. The Only Astrology Book You’ll Ever Need is not needed. What every astrologer needs is a clear explanation of the original meanings of the basic components with their myriad distinctions and nuances explained in a lucid fashion. Brennan gives this with an objectivity lacking in most treatments, and he imparts an understanding of how the components fit together. If you want to come at those basic chart elements from a totally psychological angle at that point, that is fine. However, you will do so with a much firmer and richer tool kit of distinctions at your disposal. Modern astrologers have a lot of misconceptions about traditional astrology. Traditional astrologers also have a lot of misconceptions about Hellenistic astrology. Heck, even astrologers studying Hellenistic astrology are likely to have some misconceptions about the history of the texts they are studying and the nature of some of the concepts within them. Is Hellenistic astrology part of an obsession with the ancient Greeks, or was its practice actually more strongly associated with the Roman Empire? Was Hellenistic astrology a gradual melding of late Babylonian and Egyptian astrology with Greek mathematics and philosophy, or was it more of a sudden invention, or both, and to what extent? How did historical events, like the fall of the Roman Empire, impact the practice of astrology? Brennan clearly addresses these questions and topics of contentious debate in an even-handed and scholarly manner. Many of the biggest misconceptions that astrologers tend to hold pertain to the history of their art. Are you one of those astrologers who characterizes early traditional astrology too narrowly as one single fatalistic paradigm or set of formulas? Or too broadly as being totally different with each early astrologer? Brennan provides a good overview of the way that a handful of foundational early texts helped establish a common system used by dozens of astrologers in diverse and broad ways over the following centuries. Chapter 2 which explains the early history has dedicated sections exploring the pros and cons of theories of development, discussing the evidence for each. One can find information about the source of various techniques, whether it be late Babylonian astrology, late Egyptian astrology, one of the foundational texts of Hellenistic astrology, or something else entirely. It is not uncommon for astrologers to associate Hellenistic astrology with a rigidly fatalistic perspective. This book is called “The Study of Fate and Fortune” and its author has a fairly Stoic fatalistic view of life himself. However, Chris has a whole chapter (Ch. 6) exploring the diverse philosophical attitudes that existed among Hellenistic astrologers and which flourished in the time of its practice. Brennan discusses how astrologers differed as to whether they viewed astrology as a study of signs or causes. Additionally, they differed in terms of how predetermined or fated they thought life to be. They also differed in the extent to which astrology was said to reflect fate. Interestingly, one of many possible perspectives is that everything in life is wholly predetermined, but astrology does not cause anything, only showing signs of some broad aspects of one’s fate, which an astrologer with some difficulty can attempt to interpret. Of course, many additional perspectives are possible. Certain issues of practice are more subject to contentious debate than others. Few are more contentious than the nature of house division, the use of the tropical zodiac, and issues pertaining to when planets are benefic or malefic. Brennan devotes an entire chapter to the house division issue (Ch. 11) providing a level of scholarly detail not so readily available elsewhere. While Brennan’s treatment of the zodiac debate is briefer and less detailed (a section of Ch. 8), it does provide some valuable information and food for thought. Multiple sections of Chapter 7 (Planets) explain the distinction between benefics and malefics. This includes a discussion of how malefics can signify positively and benefics adversely. Sections on sect and an entire chapter on bonfiication and maltreatment conditions (Ch. 14) help one to more deeply explore this complex and nuanced topic. These distinctions go beyond rote labels of good and bad to get at our deep need to untangle the complicated web of strain, gain, loss, and pleasure so integral to the human experience. I have personally struggled with misconceptions regarding textual integrity. The texts of Hellenistic astrology are very old and many do not survive in an early form in their original languages. Many of our English translations actually reflect later translations from Byzantine compilations, Arabic translations of Pahlavi translations of Greek, or even Latin translations of Arabic translations from the High Middle Ages. It is good to know the source of a given text and whether there is known evidence of corruptions and insertions. Brennan’s chapter on the Hellenistic astrologers (Ch. 4), and its copious footnotes, clarify textual issues pertaining to those astrologers. This is not just a book on the history and philosophy of early astrology. It is also a manual for using some practical Hellenistic techniques. After taking a deep dive into the history of astrology and the original set of factors, you will want to learn some practical Hellenistic astrology. In this regard, Brennan’s book provides a number of clearly explained useful techniques. However, it should be noted that his treatment just scratches the surface in terms of the available techniques of Hellenistic astrology (see #6 below for more on this). The point is to whet your appetite and inspire you to start reading source texts. Learn to see the chart the way astrologers did for about the first 700 or so years that horoscopic astrology was practiced. You will learn the significations of the planets, signs, and houses in depth. Brennan will also show you the most intricate and nuanced aspect doctrine that exists in traditional astrology, that of Antiochus (Ch. 9: Configurations). Through numerous examples (over 100) you will also learn some Hellenistic techniques of chart interpretation and timing. In addition to thoroughly explaining basic chart factors, Brennan also provides examples of approaches to chart delineation. For instance, Brennan shows how to understand what it means when the ruler of one house is in another house (Ch. 12-13). You will also learn to evaluate complex configurations For instance, you will learn to understand how there can be indications of opportunities which develop into problems or difficulties which develop into opportunities based on principles of bonification and maltreatment (Ch. 14). You will learn to use triplicity rulers of the Sun or Moon to judge fluctuations in well-being (Ch. 15). There is even a chapter on how to use Lots for more information about topics (Ch. 16). Get ready to see get richer and clearer information out of every natal chart. The tail end of the book consists of a couple timing techniques. In my opinion, the most important one you will learn is profections (Ch. 17). Profections was the most widespread time lord technique among the Hellenistic astrologers. It is a technique that is easy and quite useful for astrologers of all stripes. On social media I’ve noticed that even modern psychological astrologers are starting to make productive use of profections. Brennan also touches on the more elaborate form of profections used by Vettius Valens, which was Valens’ preferred time lord technique. Finally, Chris presents a technique called zodiacal releasing (Ch. 18) which survived only in the work of Valens but is Brennan’s personally preferred timing technique. Using a time lord technique like profections, you an start to learn why some transits matter much more than others. From the striking cover design by Paula Belluomini to the more than 50 figures, diagrams, and tables, this book is a beauty to behold. The text is clear and well-set. Footnotes are helpful and unobtrusive. Reference information appearing in the text, such as a list of planetary periods, is always well-spaced and easy to read. Chart examples are copious (over 100). Charts themselves are of a distinctively clear, simple, and uncluttered style that helps even beginners to stay focused on the factors under discussion. At over 600 pages, this is a hefty book. This can make it a bit of a difficult travel companion. Thankfully, an Ebook version has also been released through Google Books. The Ebook is quite a bit cheaper at a regular price of $24, as opposed to about $40-48 for the print version. As of my writing it is even on sale in the US for about $14, which is a steal. I recommend getting a copy of the book in both formats. In some ways the print book is easier to navigate as a reference. 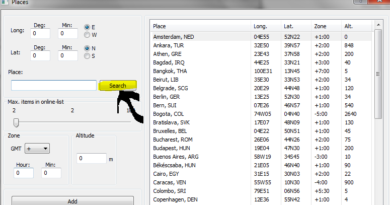 However, the Ebook will allow you to search out passages wherever you are. The print version is a strking conversation starter, while the Ebook can be read inconspicuously. While Brennan’s book should be regarded as the definitive introduction to Hellenistic astrology, it is not the definitive text of Hellenistic astrology. It is important that we make this distinction. The definitive texts of Hellenistic astrology are the surviving texts of the Hellenistic astrologers. These are sometimes large and complicated tracts. Brennan hits on the central aspects of the system of astrology found in these texts. However, the predictive astrology demonstrated in Brennan’s text has a particular flavor unique to him. Additionally, as he notes in the conclusion, he could not address some aspects of Hellenistic astrology that he regards as very important, such as the doctrine of spear-bearing. One potential danger is to confuse Brennan’s demonstration of one approach to Hellenistic astrology with being exactly how Hellenistic astrologers or some specific Hellenistic astrologer would approach the chart. Therefore, it’s important to separate the early reference-oriented part of the book from the latter manual of predictive astrology. I don’t bring this up as a criticism of the book. Both the reference and manual aspects of the book are phenomenally well done. Rather, it is all too easy to take an imposing 600 page book which is in part a scholarly reference as having illustrated all that Hellenistic astrology can do. Brennan doesn’t make this claim and in fact repeatedly reiterates that he is just scratching the surface. In reason number 5 above, I have extolled the virtues of the manual side of this book. You will learn some valuable practical techniques that come right out of Hellenistic astrology. However, keep in mind that the “manual” part of the book is intended to briefly demonstrate how some Hellenistic techniques can be used by astrologers today. Additionally, Brennan keeps his explanations of examples charts rather brief and terse in order to give the reader a feel for how examples are presented in source texts. Perusing reviews on Amazon I was struck by a couple lower ones (3-star) that mentioned they were “unconvinced” by the manual part of the book. For instance, one reviewer noted that Brennan associated a 2nd house profection with Lisa Marie Presley’s inheritance of a fortune on her 25th birthday. The reviewer critically noted that we all have 2nd place profections on our 25th birthday. However, the terse example assumes one would understand the indications of Presley’s 2nd house Jupiter ruling her 8th, and 8th house Mercury ruling her 2nd, as prior chapters explained the meanings of houses and planets. It is important to recognize that the examples are not intended to prove the efficacy of Hellenistic astrology. Chris didn’t prove 2nd house profections bring a windfall to everyone on their 25th birthdays. But what he did do was to demonstrate how an ancient predictive technique accurately timed out the symbolism of the chart in a way that reflected reality. This suggests that the technique is worth your study. The actual prediction of real world events is never simple or easy. Most people say it is impossible to do so with astrology. It would certainly be more difficult than it appears to be in these one paragraph examples using isolated timing techniques. Hellenistic astrologers looked for confirmation both of the thing symbolized in the birth chart and of the timing by multiple predictive techniques. For important matters like fame and profession, Hellenistic astrologers would often employ special techniques with their own modus operandi. Chris does not explore the full spectrum of techniques that might be required to time a massive inheritance. Brennan’s book is not intended to prove the efficacy of astrology to non-astrologers, nor of Hellenistic astrology to modern astrologers. It is a reference for those wishing to explore early astrology and its history, which also demonstrates some useful techniques. In this vein, the manual aspect of the book is a strong success. 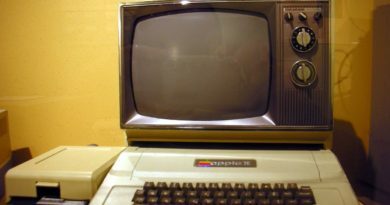 The examples pique the interest of most readers to try out the techniques and do some further exploration. Brennan’s use of Hellenistic astrology is a product of his influences and preferences. His own style is strongly influenced by that of his teacher, Robert Schmidt. Elements that characterize the astrology in the book are a focus on the reconstructed aspect doctrine of Antiochus, minimal use of zodiacal subdivisions, the use of a concept called “adversity” or “exile” (detriment; a concept actually lacking in the real Hellenistic system), and a strong predictive stress on zodiacal releasing, an obscure time lord technique which survives only the work of Valens. The astrology in this book is a simplified version of Brennan’s approach aimed at beginners. It is important to keep Brennan’s preferences in mind. The texts of the tradition are very diverse. Every astrologer has their preferences, including each the Hellenistic astrologers. One of the virtues of the book is that Brennan recognized and reiterated this fact, especially in his introduction and conclusion. Some of my favorite aspects of Hellenistic astrology are not part of Brennan’s approach. I love the use of twelfth-parts, antiscia, quadrant houses for prominence, solar returns, and primary directions. The lack of detriment in Hellenistic astrology is not something that I think requires “reconstruction”. I also like think special techniques are necessary for important matters such as profession, eminence, and marriage. Some of these things are not even mentioned in the book while others are briefly touched on but not demonstrated. Additionally, only a couple of the many predictive techniques of Vettius Valens are touched on. While Brennan’s book is phenomenal it is important to recognize what’s not there. The study of primary texts is still needed to resuscitate more aspects of this tradition. Therefore, study this book while studying primary source texts. I feel strongly that astrologers need to frequently study the primary source texts of the traditionm. There is still a great deal of valuable astrology in them that requires recovery, reinterpretation, and application. Brennan’s Hellenistic Astrology is both a great start for beginners and an extremely valuable companion in one’s studies. With just an affordable Ebook copy of this book and some free online text translations, one can start on this enriching study immediately and with rapid progress. Brennan intended his book to be used in this regard. Chris Brennan is an active consulting astrologer in the Denver area. He is perhaps best known to the general public today as the host of the popular podcast, The Astrology Podcast. The podcast takes on all things astrological, from monthly transit forecasts and interviews with popular astrologers to deep dives into historical and interpretive issues. He also offers three courses, including a brilliant one on Hellenistic astrology. Brennan is a young astrologer so we are likely to see much more serious astrology from him in the future. However, Chris is wise beyond his years, with an understanding of astrology that outstrips that of the typical veteran in the field. Brennan began to seriously study Hellenistic astrology starting in 2005, prompted by a class on the subject at Kepler College. That same year he went to live and study at Project Hindsight. There Robert Schmidt was translating texts of Hellenistic astrology into English, many for the first time. By fall of 2006, Chris became determined to write a book on Hellenistic astrology. That book would take over 10 years to complete. The result is the most thorough and helpful introduction to Hellenistic astrology to date and an indispensable reference for all astrologers. I owe a debt of gratitude to Brennan for his course on Hellenistic astrology, and now for his wonderful book. I went through Robert Zoller’s DMA course, based largely on the natal astrology of Guido Bonatti. Ben Dykes’ later landmark two-volume translation of Bonatti led me to Bonatti’s Perso-Arabic sources. Those Arab sources in turn led me back to Hellenistic astrology for further clarification. The foundational texts of Hellenistic astrology are lost but many early works drawing on them survive. The early textbooks are diverse, complex, and often only available as later medieval translations and editions. There are significant stumbling blocks to directly approaching the early works. These include corrupt and incomplete texts, insertions by later translators or scribes, and difficult or ambiguous explanations. Brennan’s course on Hellenistic astrology not only provided an introduction to the astrology of the era but also assisted with the trickier historical, textual, and interpretive issues. His book does the same, guiding one through this fascinating but challenging terrain. The Hellenistic source material is full of treasures but errors and misconceptions abound. Brennan’s book clearly lays out the history of horoscopic astrology and the core of the original system, while demonstrating important techniques. It provides the key knowledge necessary to get the most out of the source material. His text is sure to accelerate the revolution toward a richer, clearer astrology practiced by an ever more knowledgeable and respectable astrological community. Brennan, C. (2017). Hellenistic Astrology: The Study of Fate and Fortune. Amor Fati Publications. Student of astrology since the mid-nineties. Business owner, husband, and father of three. I enjoy hiking, reading, making music, and learning languages. Along with Chris’s book, I would also recommend Demetra George’s new book (part one) entitled Ancient Astrology in Theory and Practice. Part two of this is coming out later this year.